Javier Fernández of Spain performs to "I Love Paris" and "Petit Fleur" at the 2011-12 ISU Grand Prix Final of Figure Skating. Javier Fernández made figure skating history this season when he became the first Spanish skater not only to medal at the ISU Grand Prix (GP) of Figure Skating, but to qualify for the GP Final. There, he reached the podium again and took the bronze. “I am just so happy,” the 20-year-old repeated in each press conference at the Final, looking stunned that he sat next to stars such as Canada’s Patrick Chan and Japan’s Daisuke Takahashi. “Everything is working well for me,” said Fernández of the competitions and practices. It wasn’t the first time the charismatic Spaniard made figure skating history. When Fernández placed 19th at the 2009 World Figure Skating Championships, he became the first male skater since 1956 from that country to qualify for the Winter Olympic Games. It appears he will have to get used to being one of the elite skaters that are fighting for the podium positions in each event. Figure skating fans were already paying attention to Fernández a few years back when he showed up on the scene with a big triple Axel. Since then, he has added the quad Salchow and toe to his repertoire. He also finished 10th at Worlds 2011 in Moscow, another first for Spain. At this point, the judges were taking note as well. Fernández switched coaches at the end of last season, moving from Nikolai Morozov to Brian Orser. He is now training full-time in Toronto. However, he doesn’t feel that this change alone is the reason for his rise in the rankings. “I was improving before, too,” he acknowledged. The skater from Madrid decided to change coaches at the end of last season as he felt he wasn’t getting enough attention from coach Nikolai Morozov. When looking for a new coach, he and his federation quickly decided to ask Orser. The Canadian agreed, and Fernández says that he feels very happy working with him and others in his new club in Toronto. 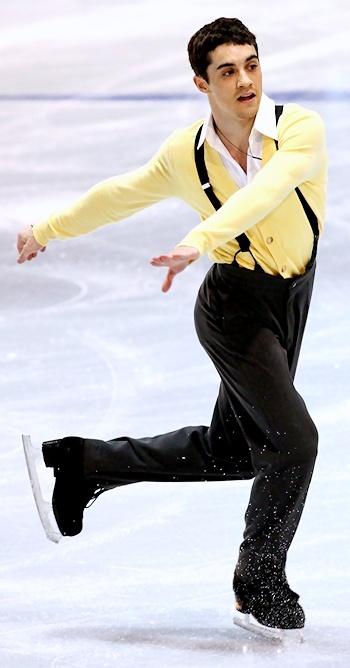 “I feel it’s extremely important that a skater at this level gets full attention,” said Orser. “I learned this from the past when working with Yuna Kim. We try to create an environment that is productive and happy. From the very beginning, communication is important. We discuss with skaters what their goals are and what they expect from us. It’s imperative that this foundation is established in order to move forward with any skater or team. The Spanish Champion has been consistently landing the quad toe and Salchow in competition this season, which obviously helped his score. He earned surprised looks from his competitors when he claimed that the quads were easy. Currently, he doesn’t include two quads into his short program but doesn’t rule out this option for the future. Fernández’s success also drew attention in Spain, a country where so far soccer is unrivaled as the number one sport. For sure, Fernández has already contributed a great deal in the sport of figure skating in Spain, and more is certain to come. He plans on competing at least until the Olympic Games in Sochi and perhaps even beyond. Since moving to Toronto last summer, Fernández has adapted very well to his new living and training environment. He describes his off-ice life as fairly normal. His mother taught him how to cook. “When I was young, I loved to be with my mom when she was cooking, so I learned. I cook Spanish food, normal food,” Fernández noted, but admitted that paella, a traditional Spanish dish, is still too difficult for him to do. Fernández also likes to hang out with his new friends in Toronto and loves his play station. He likes Toronto and it reminds him of New York. New York is special for him as his girlfriend, an ice dancer Cortney Mansour from Canada who competes with Daryn Zhunussov, is training there. “She did two Junior Grand Prix events and maybe they will go to Worlds as they are skating for Kazakhstan,” Fernández explained of Cortney, whom met while training in Hackensack. Competing in the Grand Prix Final was a big motivation for the Spaniard. His strong results in the Grand Prix has set Fernández up as a medal contender for the European Championships.